Some of our customers find the exact design they’re looking for among Appetas’ many templates. Others come to us with a specific vision of what they want—the perfect background image, color palette, and font. Now folks in the latter group can use our ridiculously simple editor to self-customize their site design. Visit the editor for your website (if you haven’t created a site yet, enter your restaurant info on the homepage, click “preview your site”, and fill in the sign-up form to start your 14 day free trial—no credit card required). Click the paintbrush on the left to bring up the theme options. At the bottom of the box, click the “Customize Theme” button. Choose whether you would like to change the background, colors, or fonts. Choose from one of the theme options in the box OR drag and drop your own background image in the space provided OR click “Choose File” to upload your background image. Tip: You’ll need a high quality photo for your background. We recommend a professional photo of your restaurant’s interior or exterior. 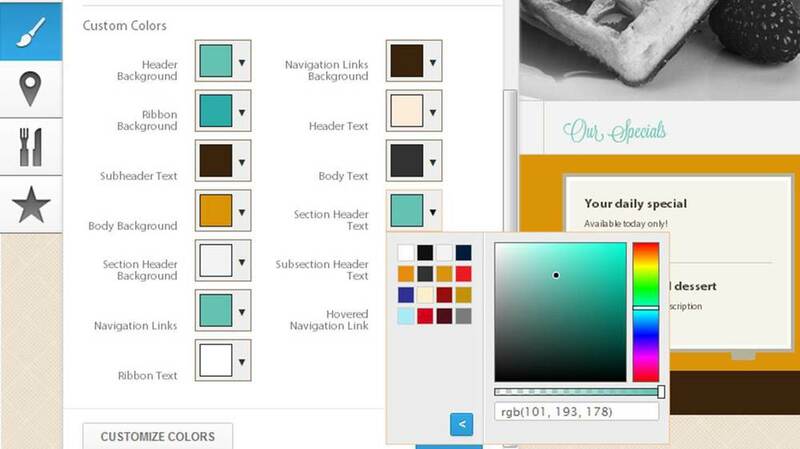 Choose a color palette in the dropdown OR click “Customize Colors” to select the precise color for headers, text, etc. Tip: If you have a logo, pick some of the colors from your logo for your website’s color palette. Choose a font option in the dropdown. It’s sort of like Instagramming your website. Go ahead, give it a try. Have another feature suggestion? Drop us a note. We’d love to hear from you.